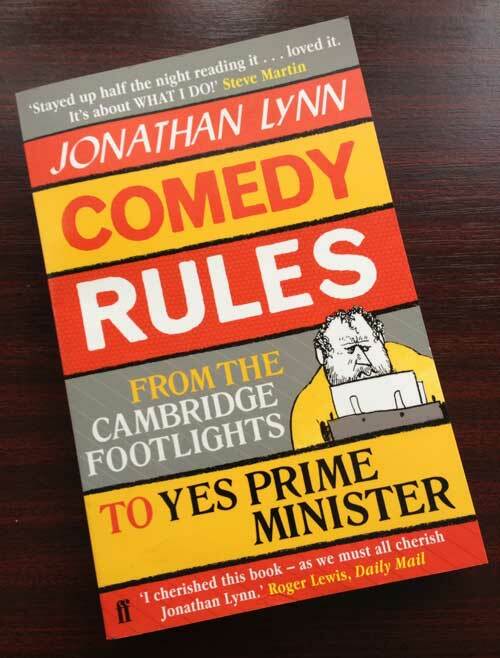 Part-autobiography, part-tutorial, part-ramble, Comedy Rules: From the Cambridge Footlights to Yes, Prime Minister is Jonathan Lynn’s look back at his career in acting and directing and in particular in comedy writing, and it’s full of excellent advice for those aiming to succeed him. The rules of the title pepper the book — there are 150 in all, over 200 pages — and range from the relatively obvious to the insightful. For example, rule 35: It is hazardous to your career to make sexist jokes about women. Not a surprise, though somehow it still needs repeating. And then by contrast a few pages later, rule 39: If a band — or film crew — laugh loudly at a joke, you should probably cut it. Because, he says, “the band will only laugh at any new line which is a variation of the original.” And then there’s rule 98: Beware a phone call from the Inland Revenue, even if it’s an invitation to lunch. Despite the title, these aren’t so much rules as lightly educational anecdotes: lessons he’s learned over the years through sometimes bitter experience. We skip between the decades, from his student days to more recent times as a film director and screenwriter, and back. Every story is funny, enlightening and well told, and occasionally guest-starring comedy gods such as John Cleese or Steve Martin. Quite possibly my favourite story follows rule 117: Try to resist if the Prime Minister wants to join your writing team. If you remember the cringeworthy “sketch” Margaret Thatcher wrote while PM featuring the two main characters from Yes, Prime Minister, you’ll know what this anecdote is about. There’s poignancy too. Lynn describes working on the play Loot with Leonard Rossiter, a masterful comic actor but a perfectionist who could be difficult to deal with. The play was a huge success and they became friends, and then Rossiter died suddenly: in his dressing room, from an aneurism, during a performance. Lynn includes the eulogy he gave at the funeral. Lynn’s one of the greats behind the camera of post-war British comedy, up there with Galton and Simpson, John Sullivan, Eric Sykes, Muir and Norden, and so on, and Comedy Rules is a fantastic memoir. Recommended.